Crossing Worlds Hopi Projects took an active role in inviting Hopi artists and cultural presenters to our first Verde Valley Archaeology Center Fair March 23 and 24, 2012. We helped support the participation of 30 Hopis at our first fair who brought with them the authentic sense of Hopi life and thought. The Hopi presence brought a depth of cultural experience for fair visitors and generated a lot of energy, interest and enthusiasm. Hopis are the living descendants of the ancestors who abandoned the thousands of prehistoric village, rock art and farming sites around the valley by 1425. For the Hopi these sites are still alive with spiritual presence and many of them are visited annually by different Hopi clans who leave prayer offerings at them for the continuance of life. Our goal is to bring the “ruins” to life by providing fair visitors a chance to interact and learn from the Hopi people. We also have a goal to support Hopi people in having a place to sell their art (to support their traditional life) and enjoy a weekend festival time out from their busy reservation life. We also want to extend a chance for Hopis to see some of the local ancestral sites. The Natwani Coalition presented a video they made on traditional Hopi farming and answered questions. This was a special opportunity to meet Hopi farmers Leonard Taleswaima and Kyle Knox. We are the only non-Hopis they have shown images of their Hopi farming to as it is part of their curriculum for Hopi youth and carries with it traditional values. We all learned a lot listening to them. Natwani means “produce” or “vegetables,” but more significantly, it refers to the processes and rituals necessary for the rejuvenation of all life. It is the intact web of obligation and activity involved in the planting, harvesting, processing, hunting and gathering of food. It is physical and spiritual sustenance. The coalition is part of the non-profit Hopi Foundation (a non-governmental Hopi run group). Natwani plays an important role in educating Hopis on traditional foods and farming with a goal to expand participation in farming and improve the Hopi diet. 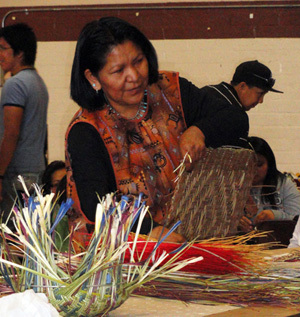 Dorlene Gashwesemoma, a traditional basket weaver worked on baskets all weekend and yet so warmly greeted everyone who came to her table. Very Hopi. The Natwani presenters were pleased with this, their first “outreach” event and will come again (with support as they have no budget for outreach). Many of our attendees I know are going to go to the Hopi Agriculture symposium up there in July. We sponsored the Yellow Fox dance group from Moencopi, three generations, all active participants in Hopi traditional life, who shared the Butterfly Maiden dance and others each day 3 times. This is the first time they have done this traditional social dance off of Hopi land. The father and son are traditional carvers. The family dance group brought Hopi with them as they stayed in their family circle focused on their dances and their traditional style crafts. At one point they literally circled their chairs with the 4 year old walking around the middle. This is the essence of traditional Hopi. And the little 4 year old boy was drumming on the stage floor and singing along with his Dad, uncle and grandad. Timeless Hopi. We had a special project to bring a young family who had hardly been off of the Rerservation to the Fair. Our voluntee Charles West, picked them up a Hopi and returned them to meet their ride in Flagstaff at the end of the weekend. They hosted the family in their home and made sure they had all the support they needed for the weekend. We also gave them a a hotel night with chance to swim for young girl in the family (now she wants to learn how to swim–they have NO pools at Hopi). It was so powerful an eye opener for them to come down here. The Hopi family gained confidence, self-esteem, opened new horizons. They want to come to more events and may bring a dance group themselves. They had never even been to Sedona, know nothing of their ancestral heritage here. It was scarey for them to do this. Brings tears to my eyes. This is some of the positive, personal effects of our cross-cultural outreach. Our fair guests really enjoyed talking with them too. One of our circle, Kathy Dunham, took the Dad and daughter over to V Bar B and that was also very insightful for them. Kathy and Jackie Kleiger, who are site stewarts and VVAC members, did a terrific job catering homemade sandwiches each day. And Deborah Williams also provided a lot of food for the families. Sandra coordinated the Hopi presentations and made the Hopis feel at home. I loved this team effort. This image encapsulates the human side of our event for me: happy local elders having made new friends from Hopi and this young family who got a whole new breath of inspiration. Myra, the Hopi daughter, loved getting a whale painted on her face at fair–she was having her own cultural experience. We paid for some of the hotel and transportation costs and provided the lunches for 30 Hopis (even had some extra for some of the other Native presenters) which really helped their budget and made them feel welcomed like they do on the Reservations. Sandra Cosentino did extensive pre-conference coordination with Hopi participants so they would feel comfortable and secure coming to this off-reservation event. Ken Zoll, the inspired event coordinator for the Verde Valley Archaeology Center, did a terrific job creating and managing this fair. Hopis are children of the corn, we are the corn, corn are our children. The corn hear you, see you coming, which is why we sing to them. Creator gave us the destination, the chosen place we live within. We carry out the Hopi way of life and live with heart. ” If we pray hard enough, we hope to have lots of snow.” This helps at corn planting time. Once the corn is harvested by the men and boys, the women and girls become the caretakers of the harvest. They take care of the children and the corn. Ramson Lomatewama, glass artist, cultural lecturer. We invite you to get involved in our March and September annual cultural sharing at the Verde Valley Archaeology Center special weekend events. And just come and enjoy the event. For me, the sense of Native community was very rich that weekend. The time flew by. I really enjoyed it and learned a lot as well. Come join us!